Dave and Ros have been running this family owned business for 12 years serving fresh, local and wholesome food. They gave me a wonderfully warm welcome on what was a very dreich day. The colours of the trees and bracken were wonderfully autumnal as I drove through Deeside but unfortunately there was a constant drizzle. Over a flat white and a freshly made star shaped fruit scone I leaned more about Taste and its ethos. 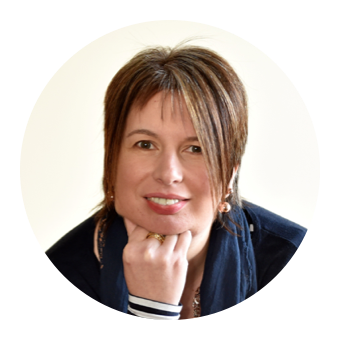 When I arrived Ros looked rather familiar and I soon discovered that she is the sister of Anita who owns the wonderful Teacake just a mile from me in Chapelton, Newtonhill. What a small world! 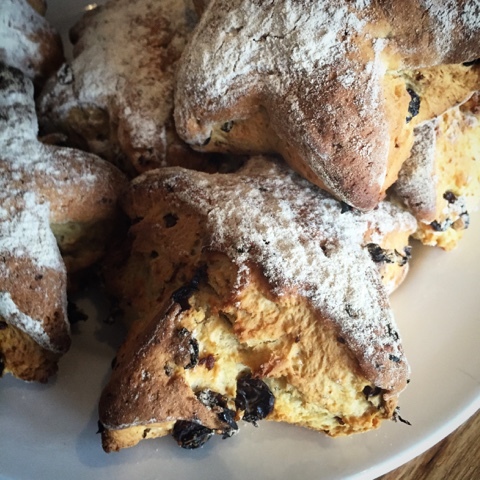 Baking clearly runs in the family as the scones which are made daily tasted great. I too shall be experimenting with a star cutter. The cake cabinet was groaning with delicious homebakes but I had to save myself for the remainder of my trip. 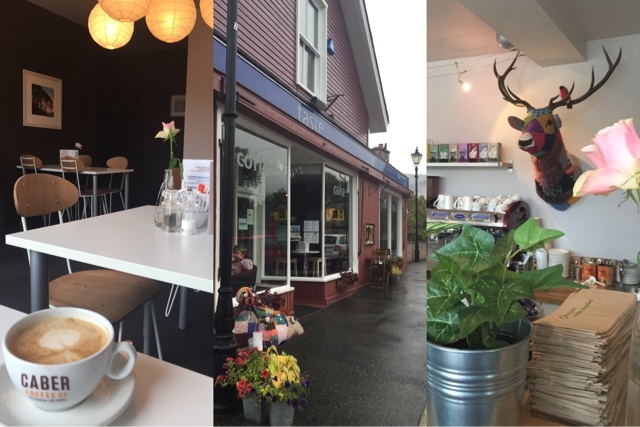 The cafe has a modern and stylish look about it including an awesome knitted stags head which observes all from above the counter. There's also a small ambient deli area selling an interesting range of primarily Scottish products. 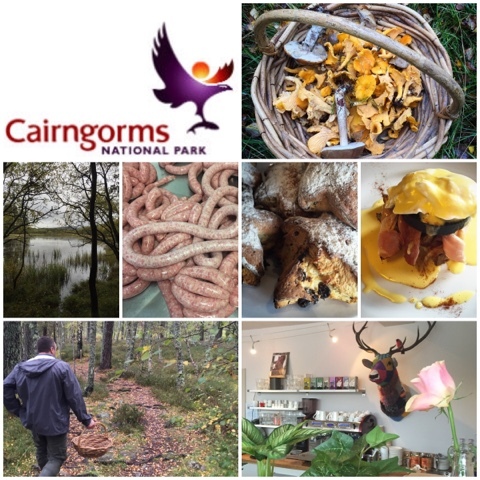 The menu is right up my street featuring local and artisan produce such as meat, free range eggs and venison pate from the local butcher, cheeses from Cambus O' May creamery and fruit, veg and milk from Gow's Deli in Ballater. All soups and homebakes are made in house with the exception of pancakes and Balmoral Bread from Chalmers in Ballater and there's lots available for those following vegetarian or gluten free diets. Taste is as far removed from a "tartan tearoom" as is possible to get. Whilst that might mean its not everyone's cup of tea, it was most certainly mine. There's also freely available wifi which within a rural setting is pretty much essential when selecting a cafe if you're a social media addict like me! I'll definitely be making a return visit next time I'm in the area with one of their 'assemble it yourself' sandwiches at the top of my must try list. 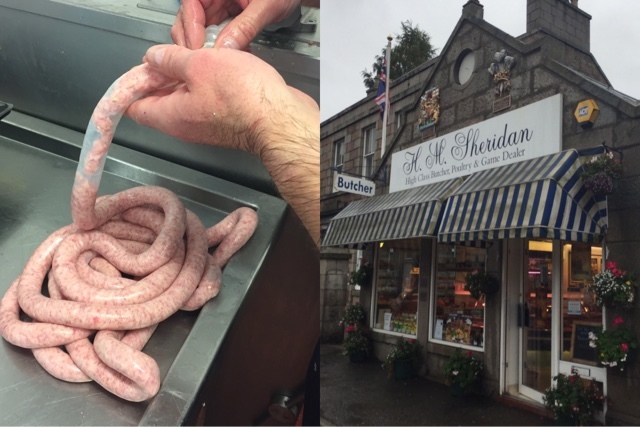 My next stop was HM Sheridan Butchers on Ballater's main street. They are Royal Warrant holders to Her Majesty the Queen and the Duke of Rothsay and as such supply their produce to neighbouring Balmoral. My task for the day was to help make a batch of their popular pork sausages. 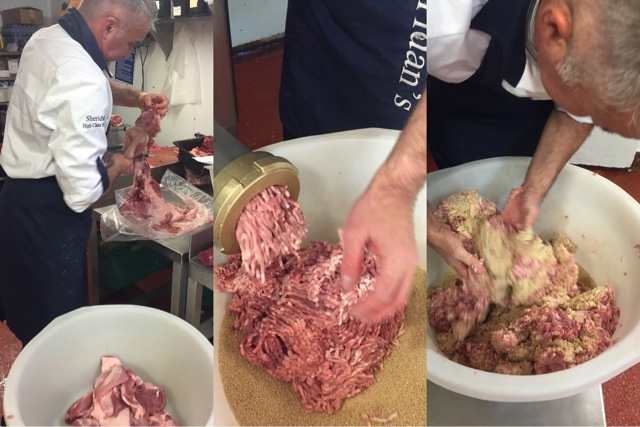 I've made sausages before with Andrew Gordon and The Store but have never quite managed to master the whole process successfully. Would it be third time lucky? 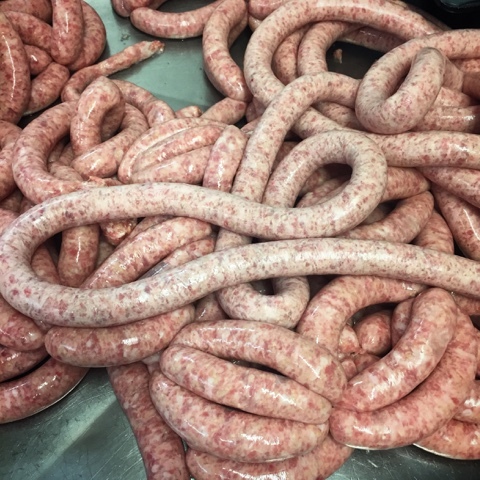 Whilst the batch we were making were standard pork sausages I was interested to lean about their vast range of flavour combinations. These range from Hog Roast, Venison and Steak & Deeside Stout to Beef & Buckfast and Pork and Irn Bru. I wonder if any of those end up on Her's Majesty's breakfast table?! Pork was minced before being combined with flavouring and rusk and minced for a second time. Then the fun part. Filling the sausage skins. Sheridan's only use natural skins and I seemed to get the hang of filling them reasonable evenly, controlling the flow of sausagemeat by pressing a pedal with my leg. Now the tricky bit. Making links. This is the part of the process that I'd really fallen foul of on previous attempts. Quite literally tying myself up in knots. A mixture of macrame, knitting and crocheting skills, plus an extra pair of hands is required to accomplish a successful string of sausages. Eventually I managed to get into a rhythm of pinching, squeezing and looping and produced a reasonable batch with not too many rejects. Whilst the Queen had left Balmoral that very day, Prince Charles was still resident on Deeside and I was informed that the sausages were heading his residence at Birkhall that very afternoon. I'd like to take this opportunity to apologise to HRH for any slightly wonky shaped or burst ones. I don't hold out much hope of an OBE for services to sausage making. Those that I took home did however taste great on the BBQ. 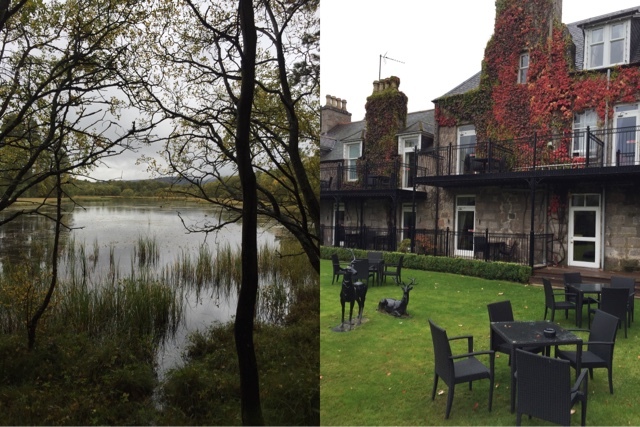 My final destination on Deeside was the Loch Kinord Hotel in Dinnet. Jenny and Andrew Cox own this delightful small Country Hotel which has AA Rosette and Taste of Scotland approval. The 22 rooms are each individually designed featuring stylish tartan, stags and thistles in tones that reflect the mood and colours of Deeside. Award winning Head Chef Maciej Jaworski makes the most of the the fact that the hotel is blessed in its setting and uses an abundance of fresh local and seasonal produce including meat, game and fish. 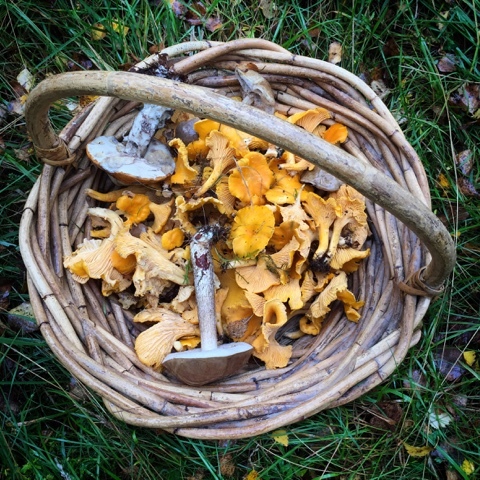 The menus showcase the best of Scotland's larder and are further enhanced by the bountiful harvest of foraged flavours freely available from roadsides, fields and woodlands. As part of a wonderful tasting lunch I watched Maciej cooking up a storm in the kitchen before tucking into a delicious selection of dishes. 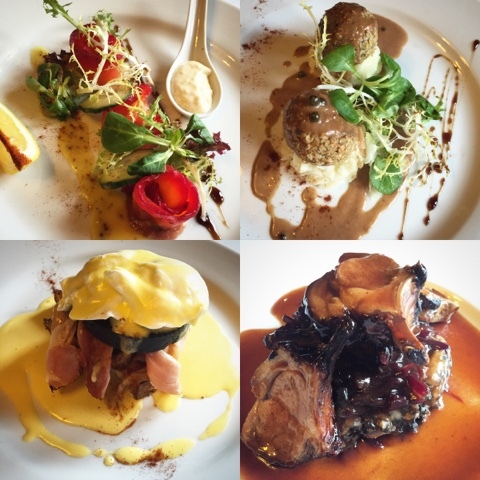 Our starters were Home Cured Gravadlax with Horseradish Cream, Haggis Truffles With Pomme Purée and a Light Whisky Cream Sauce and an amazing Stornoway Benedict. This comprised of Stornoway Black Pudding, Honey Roast Ham, Poached Free Range Hens Egg, Toasted Brioche & Hollandaise Sauce. A dish to die for at any time of day. The stand out dish for me was Wild Mushroom Risotto Served in a Parmesan Cheese Basket. The flavour was amazing and the concept of a cheese basket is pure genius. I am definitely going to attempt this at home. Whist the crispy cheese was great the best bit was the gooey part where the risotto had started to melt the cheese basket. Absolutely divine. In anticipation of my arrival Maciej has spent the morning foraging in the pouring rain collecting his bounty of fungi. As the weather had now eased he invited me to join him on a post desert foray into the woodlands surrounding the hotel. 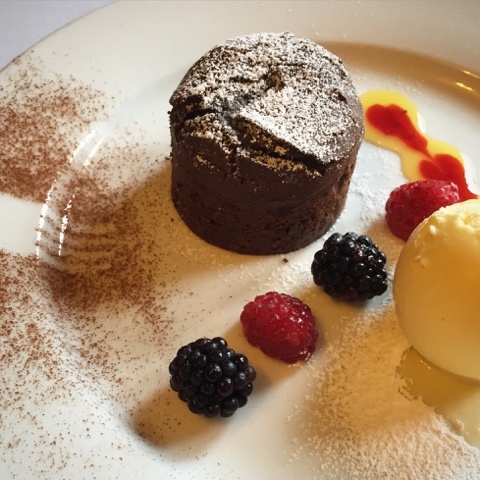 I'm not a huge desert fan, tending to opt for the cheeseboard over sweet treats but the Chocolate Fondant was sheer perfection. Perfectly gooey in the middle whilst the richness of the dark chocolate was cut through exquisitely by the berries, fruit coulis and ice cream. With a very full belly it was time for a quick change of clothes into wet weather gear before heading out on a Fungi Forage with Andrew and Maciej. We really didn't have to wander too far into the woods before I spotted my first Chanterelle. These are the only edible mushrooms that I'm 100% confident of identifying correctly. However even if you mistake a false chanterelle it won't poison you. You'll just be somewhat disappointed with the taste. Soon we got to Andrew's secret hot spot where there were rich pickings. I should have recorded the GPS co-ordinates at this point as there's no way I'd ever find the exact spot again. We even managed to loose Maciej at one stage. 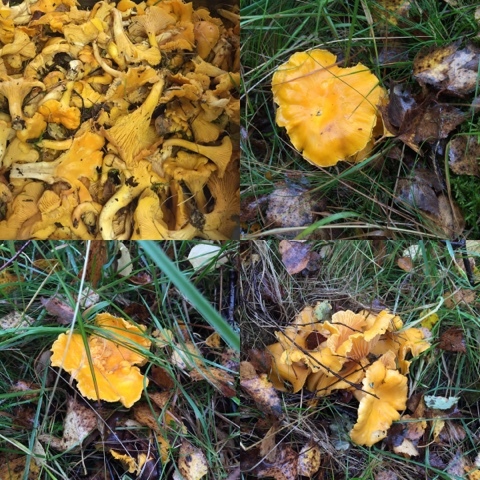 The abundance of fallen yellowing birch leaves did make chanterelle spotting somewhat tricky. With a full basket we retraced our steps (alas the pesky birds had eaten the trail of breadcrumbs) and passed a beautiful viewpoint where weddings can be held. An idyllic seting for a Royal Deeside wedding. Time to head home with my basket of mushrooms and get creative with them in my own kitchen. They made their way into a chicken, bacon and chanterelle filo pie, a Mediterranean fish pie with crumble topping, a creamy pasta dish and some simply pan fried with vast amounts of garlic and butter. 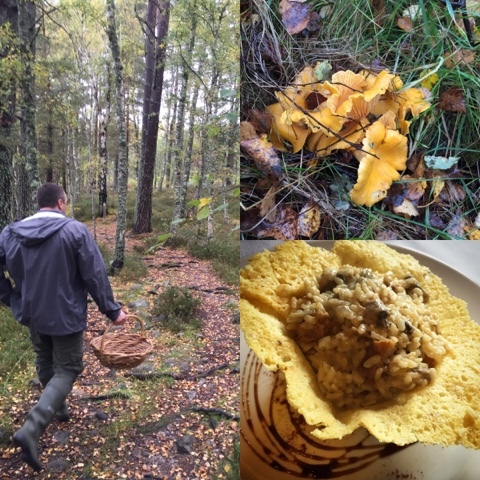 A fantastic culinary memoir from a wonderful day on Royal Deeside. The Cairngorms National Park is known as a haven for winter sports, but it is a year-round destination for those who love the outdoors and enjoy holidays off the beaten path. As an events-led destination, there’s always something happening, no matter what the time of year. The Cairngorms National Park is accessible by road and rail from all over the UK. For those flying to the area, the western side of the park is served by Inverness Airport while the eastern side is served by Aberdeen International Airport. Disclosure : Disclosure - Press Trip courtesy of Cairngorms National Park. Thanks to Tricker PR, Taste, HM Sheridan and Loch Kinnord Hotel for facilitating. All views expressed are my own. My dad used to ski in the Cairngorms when I was a child - each time he'd bring me home a new stuffed Loch Ness Monster until I had quite a collection!! Looks like they're serious about their sausages up there, if I went to Scotland again I'd like to revisit that area. What a gorgeous place in a stunning setting. I love the sound of that risotto in a parmesan basket, too! What a beautiful place to visit, especially at this time of year. The risotto sounds amazing too.